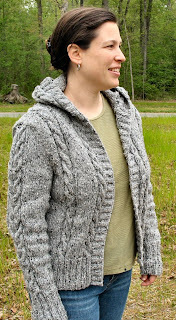 Imagine knitting your first EZ pattern ever, a Baby Surprise Jacket. While there is a recipient baby in mind, you mostly knit this pattern for the hell of it, just to figure out the origami of the pattern. 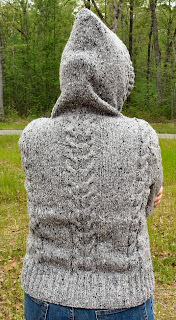 Now imagine making this infinitely fascinating, incredibly clever little garment with leftover yarn from the stash. Imagine knitting it in three days. You are both resourceful and productive! Now imagine being inspired by the infinite possibilities of such a little jacket, and having knit a prototype, you understand how it works. You know where to add striping and contrasting edging details and you now look at your sock yarn stash in a whole new light. You modify the pattern to suit your needs and your tastes. You write a fascinatingly informative blog post about it, too. Now imagine having a baby on the way to picture wearing your clever, colorful Baby Surprise Jackets. No! Not me! You've just imagined that you are Mrs. Frick. Now go read her post, admire her BSJs, and be excited for her bit of baby news. I finished my CPH Monday evening. The temperature was 80 degrees upstairs in the study. I didn't even want to try it on; I certainly didn't take any pictures. I just wanted to get the pile of wool off my lap. Today it's a cool, overcast day. A great day to wear the Hoodie on R's Spring Walk by the river. I received lots of compliments on the sweater (mostly because everyone else was shivering in shorts and t-shirts, but also because I ran around telling everyone "I made this, isn't it great?"). Modifications: I was worried about the tightness on the arms as I knit the sleeves, so I increased every 8 rows, 6 times and then every 4 rows, 5 times. If this sweater hadn't been so chunky, the strange rate of increasing would have been bad, but it turns out to not be noticeable. I don't think the sleeves would have been too tight if I had followed the pattern. Not being on the slim side, I knit the 44" size and it seems to be just right. I have not blocked it yet, but I will. Maybe. After the weather warms up. I joined the shoulder seams with a 3-needle bind-off, but didn't do short-row shaping for the back. I should have followed Liz's advice, but it was too late! I simple stuck the stitches on a holder instead of binding off. It worked out just fine. If I knit this again, I would do a 3-needle bind-off on the hood before the ribbed band and then knit the border all in one piece to avoid the join at the top of the hood. Lynda details this here. No buttons. I may do clasps later. I may not. I kind of like it just open like this. The yarn: I like wearing the yarn. I did not always enjoy knitting it. It breaks easily when seaming and at random inconvenient moments when knitting which I find very irritating. 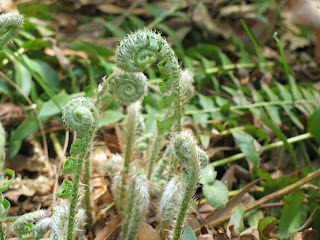 Its nubby habit is quite nice visually, but does not always allow for the best flow while knitting. I have 7 skeins left so I'll knit again with this yarn, but I need a break for now. 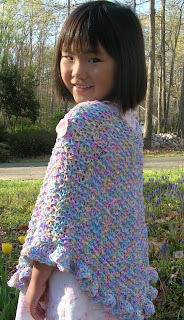 I briefly posted about a cami I was knitting for my Rosebud, my contribution to the Create-A-Long blog. 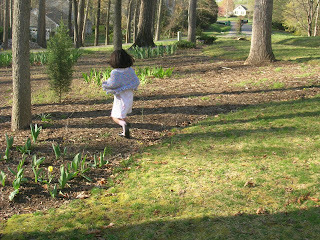 There has been a long silence about that little cami for a tiny 6 year-old, no? I hit a road block, and the piece needed its requisite time in the penalty box. The neckline was too low, even for a top meant to be worn as a layer. And I needed to decide on some kind of treatment to neaten the edges up, and nothing was coming. The denim yarn was tripping me up. There is an inherent challenge when designing with denim -- the shrinkage, of course. See, with shrinkage, you get all sorts of surprises. For example, when I swatched, I discovered that the diagonal lace caused my top to shrink in both length and width, rather than just lengthwise. The significant changes in gauge make it a true guessing game to add unwashed yarn to an already-shrunk piece -- what needle size should I use? What will it do when I wash it again? I also really wanted to protect the main design element of the camisole, the transitions of the lace pattern up the bodice, and the contouring of the straps around the final lace repeat. They worked exactly the way I intended, and I didn't want my solution to interfere with it. I also wanted to keep the tied straps, so I could have the option of adjusting them on my growing kid. So I consulted with a brilliant designer over a cup of coffee last week, and we together hatched a solution. I would frog back to the armholes and using my unraveled swatch, reknit a significantly higher neckline , and keep all the stitches live on holders for the application of an i-cord edging that would extend into the tied shoulder straps. The bad news is that now the neckline is a little too high and, but the good news is that it will work fine for the back, and I will start the neckline a couple of rows lower for the front piece. The other issue is that the strap transition has lost its pointiness, and now has a rounder look around the arm. I think it might straighten out once worn. Either way, I think I am going to live with it. The wonderful surprise is the eyelets along the neckline created by applying an i-cord to decreased stitches. I love how it echoes the laciness of the pattern. I decided to leave the armholes unfinished for now, with the idea that I may single crochet around the edges once it has all been washed and seamed. Strawberry Clutch by Kate Gilbert in Spring 2007 Knit Scene. Used Cascade 220. Actually made two. Why not? 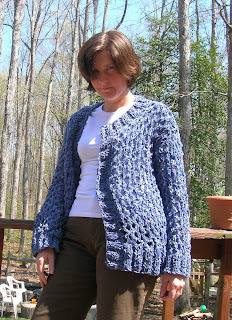 Bad Penny by Stephanie Japel in Louisa Harding's Nautical Cotton. Crazy Freak Out sweater. It was just wrong. It's not that I'm not trendy. It's not that I don't want to be just like all the cool bloggers. It's just that I am rarely organized enough to participate in blog trends. But I was determined to jump on the Chevron Scarf bandwagon, even if it spelled destruction for a perfectly wonderful pair of socks. Info and Thoughts: I did consider making this scarf longer, but stopped after a few chevron knitters confirmed my concerns about stretching. I am thrilled with the result. As I mentioned before, I realized this winter that I did not own any handknit scarves. This was an unacceptable state of affairs, and totally worth the sacrifice of the Anastasia socks in order to remedy it. It matches my spring coat perfectly, and I suspect I will be knitting myself more scarves to match all of my coats. I'll be wearing it when Ann and I go to MDSW. Who else is coming? I've casually mentioned that I have been on a yarn diet in anticipation of MDSW, and I am pleased to say that since my self-imposed hiatus at the beginning of February, my stash has grown by only 4 skeins of yarn. I purchased one extra ball of Rowan Denim to allow for fearlessly ample swatching for my Create-Along cami (more on that this week, I hope), one skein of Mountain Colors Bearfoot, and received these two beauties in the mail from Minty. Now, admittedly, I feasted on yarn in December and January, and my stash downright exploded, but I am pleased to say that much of that yarn has already been knit: Cascade 220 CPH, the Alpaca with a Twist, the Vesper and Bearfoot. But I love these periods of famine to allow me to rediscover hidden gems and long-forgotten yarns. They stretch my creativity and give me a feeling of endless resourcefulness, by choosing projects from what I have on hand. Thus, my latest FO, from what I think might be among the oldest yarn in my stash. Some oddball of jacquard sock yarn (I'd guess Regia) produced this pair of socks for my Pepe. This yarn was bought long enough ago that I (1) did not know that I would need two balls of sock yarn to knit adult socks and (2) actually threw out the label. I think I ordered it from Herrschners over 4 years ago. He calls them Season Socks, and he claims their season is winter. A good thing, too, since we woke this morning to snow. This is Miami from Rowan's Cotton Braid book knit in Maggi's Rag. I'm not sure why I made this sweather other than I was not in my right mind at the moment and on the verge of a minor freak out. Knitting makes these things better even if the final product isn't exactly wonderful. Now, I'll have a huge holey sweater to remind me of this time in my life. I did not just frog a pair of socks this week. I also knit a pair of socks this week. These socks are for Mr. S. Basic garter rib from the toe up with a Widdershins heel flap. I know, as usual. Regular readers know that this is usually the place where I complain about knitting things for my Mr S since he is so damn big. His size 13 feet are no exception. But I have no complaints about these socks, since I knit these in less than 10 days. 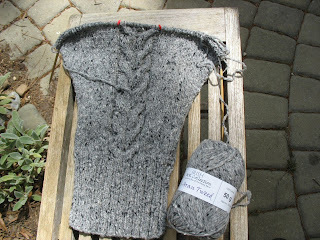 I cast on for the second sock at Sit N Knit on Wednesday and finished by Saturday afternoon. Ignore the weird hump on the instep. They bunched a bit in his shoes. Meet my new favorite man sock yarn: Mountain Colors Bearfoot, knit on US3 Inox circs. These were an unmitigated pleasure to knit, from the subtle color variegation (this colorway is Steelhead) to the soft feel of the yarn. I didn't even mind my nose tickling from the mohair. They'd be a little thick for me, but for a warm, thick wool sock, this yarn is great. Look for reports for wear as Mr S puts them to good use. Mr S loves handknit socks, and has been very excited to receive his latest pair. And now that I have discovered this yarn, he will be receiving more, for sure. His father has also requested a pair. Next up on the sock needles is a pair of socks for Pepe, the only one in our little family without handknit socks of his own. ETA: I need some advice. 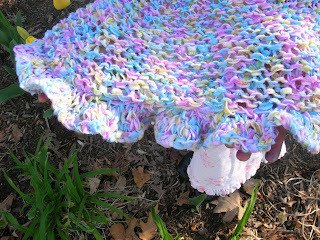 My SIL wants a lace shawl similar to Icarus. She likes the mostly stockinette body of the shawl, with a lacy border, rather than an all-over lace pattern. I'd like to knit it in laceweight, as she really liked the weight and feel of the yarn. Any suggestions, anyone? I am willing to purchase a pattern or book for the right one. I do not have a large library of lace patterns, so I could use some guidance. Allergies have hit our house. 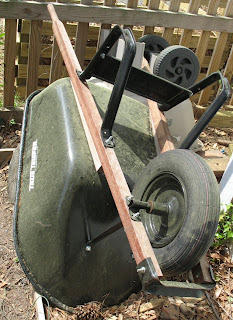 Can you see the pollen film on the wheelbarrow? That's how my house looks now because I can't stand to have my windows closed when it's nice out. It's cold today, so I'm trying to mop and dust. Yuck. 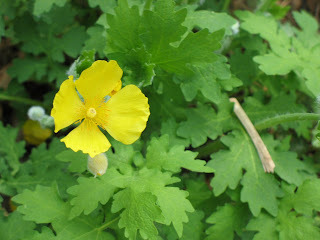 But the good news is that my garden is coming alive! As are the sleeves for the CPH. I planned on knitting them according to the pattern and dealing with tight sleeves, but I really didn't like how narrow they were coming along, so after about 6 increases every 8 rows, I bumped it up to every 4 rows and added an extra increase. My theory is that the more frequent increases will hit right around my elbow so it won't look too funny and that just adding 2 more stitches won't be a big deal with the armhole shaping. In a recent post, I asked for feedback about frogging the fuschia Anastasia socks in service of Chevron Madness. The votes were pretty clearly on the side of keeping the socks and many commenters suggested that I keep the socks and buy more Koigu. - The colors match my Spring coat perfectly. - I really want a chevron scarf. Really badly. 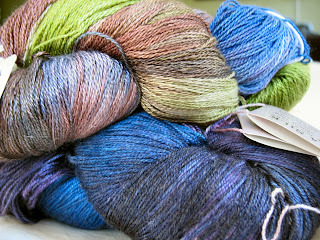 - I truly am not buying yarn until the MD Koigu Binge MDSW. Buying more yarn is not currently an option, and I want a scarf now. - I do not have a handknit scarf. Seriously. As Theresa said, I have a bunch of socks. I have about a dozen currently in rotation, and wool sock season is hopefully at an end until September. But after 6 years of obsessive knitting, I do not have a great handknit scarf! I'll say it again. I DO NOT HAVE A HANDKNIT SCARF! I have been wearing the same turquoise pashmina scarf for years now. I have made some scarves, but have either given them away, or they are not exactly wearable. There's one that's too itchy. This one stretched beyond wearability. So it is time for this knitter to actually have a scarf. Thanks for the feedback, friends, but I gotta do my thing. I must have this scarf. And a few others too, I think. ... Mouse's Jelly Bean Poncho! The yarn is Knit One Crochet Too Tartelette in Jelly Bean (color 120). 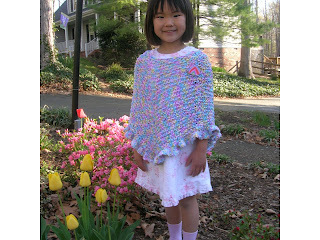 I decided to wing the pattern, but Mouse added the request for the ruffle, which totally makes the poncho a winner. We are both very happy!